The Hohenstaufen-ruled Holy Roman Empire (c. 1138–1254) and the Kingdom of Sicily. Imperial and directly held Hohenstaufen lands in the Empire are shown in bright yellow. This was the greatest territorial extent the HRE ever reached. This list of states which were part of the Holy Roman Empire includes any territory ruled by an authority that had been granted imperial immediacy, as well as many other feudal entities such as lordship, sous-fiefs and allodial fiefs. The Holy Roman Empire was a complex political entity that existed in central Europe for most of the medieval and early modern periods and was generally ruled by a German-speaking Emperor. It should be mentioned that the states that composed the Empire, while enjoying a unique form of territorial authority (called Landeshoheit) that granted them many attributes of sovereignty, were never fully sovereign states as the term is understood today. 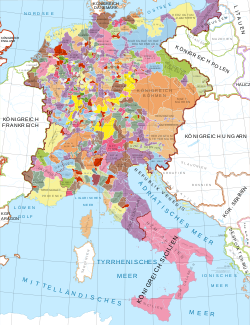 In the 18th century, the Holy Roman Empire consisted of approximately 1,800 such territories, the majority being tiny estates owned by the families of Imperial Knights. This page does not directly contain the list, but it discusses the format of the various lists, and offers some background to understand the complex organisation of the Holy Roman Empire. The lists themselves can be accessed via the alphabetical navigation box at the top of this page; each letter will lead the reader to a page where states of the Empire which began with that letter are listed. For a more complete history of the empire, see Holy Roman Empire. While any such list could never be definitive, the list attempts to be as comprehensive as possible. It is sorted alphabetically and split into separate articles linked in the box below. There is also a separate list of Free Imperial Cities, as well as a list of participants in the Imperial Diet as of 1792. The "Circle" column shows the Imperial Circle (Reichskreis) that the state belonged to. The "Bench" column shows where the state was represented in the Imperial Diet (Reichstag). Note that in the "Circle" column, "n/a" denotes a state that had ceased to exist before the Reichsreform. Imperial Abbey Reichsabt: A Reichsabt, literally 'Imperial Abbot' or 'Abbot of the Empire', was an Abbot whose abbey was granted within the Holy Roman Empire the status of Reichsabtei (or Reichskloster), literally 'Imperial Abbey' (or – Monastery), meaning that it enjoyed Imperial immediacy (Reichsunmittelbarkeit). Imperial Circle: An Imperial Circle (in German Reichskreis, plural Reichskreise) was a regional grouping of states of the Holy Roman Empire, primarily for the purpose of organising a common defence and of collecting imperial taxes, but also as a means of organisation within the Imperial Diet. Imperial Diet (Reichstag): The Imperial Diet was the parliament of the Holy Roman Empire. The same name was used within the North German Confederation and within Germany until 1945. Imperial Estate: An Imperial State or Imperial Estate (German singular: Reichsstand, plural: Reichsstände) was an entity in the Holy Roman Empire with a vote in the Imperial Diet. Several states had no seats in the Empire, while some officials (such as the Hereditary Usher) were non-voting members; neither qualified as Imperial States. Imperial Free City: In the Holy Roman Empire, an imperial free city (German: freie Reichsstadt) was a city formally responsible to the emperor only – as opposed to the majority of cities in the Empire, which belonged to a territory and were thus governed by one of the many princes (Fürsten) of the Empire, such as dukes or prince-bishops. Free cities also had independent representation in the Imperial Diet of the Holy Roman Empire. Imperial immediacy (Reichsfreiheit or Reichsunmittelbarkeit, adjectives reichsfrei, reichsunmittelbar): Immediacy was a privileged feudal and political status, a form of statehood, which a city, religious entity or feudal principality of minor lordship could attain within the Holy Roman Empire. An immediate city, abbey or territory was under the direct authority of the Holy Roman Emperor and the Imperial Diet, without any intermediary Liege lord(s). Advantages were that immediate regions had the right to collect taxes and tolls themselves, and held juridical rights (including the Blutgericht, 'high' justice including capital punishment) themselves. De facto immediacy corresponded to a semi-independence with a far-reaching autonomy. Imperial Reform: In 1495, an attempt was made at a Diet in the city of Worms to give the disintegrating Holy Roman Empire a new structure, commonly referred to as Imperial Reform (in German: Reichsreform). Imperial State: An Imperial State or Imperial Estate (German singular: Reichsstand, plural: Reichsstände) was an entity in the Holy Roman Empire with a vote in the Imperial Diet. Mediatization: defined broadly, is the annexation of one monarchy by another monarchy in such a way that the ruler of the annexed state keeps his or her noble title, and sometimes a measure of power. Thus, for example, when a sovereign county is annexed to a larger principality, its reigning count might find himself subordinated to a prince, but would nevertheless remain a count, rather than be stripped of his title. Prince of the Empire: A Prince of the Empire is any ruling Prince whose territory is a member of the Holy Roman Empire (not only German-speaking countries, but also many bordering and extensive neighbouring regions) and entitled to a voting seat (or in a collective voting unit, such as the Grafenbank) in Imperial Diet or Reichstag. Prince-abbot: A prince-abbott (Fürstabt) or prince-abbess (Äbtissin) was an abbot or abbess who had been granted the rank of prince. Prince-abbots (but not prince-abbesses) had seat and vote on the Ecclesiastical Bench of the College of Ruling Princes of the Imperial Diet and sat alongside the prince-bishops. Prince-bishop: A prince-bishop (Fürstbischof) was a bishop who had been granted the rank of prince (Fürst). As a prince, he was the temporal ruler of a Hochstift and as a bishop, he exercised the spiritual duties of an ordinary bishop over his diocese, which was always larger than his Hochstift. Prince-bishops had seat and voice on the Ecclesiastical Bench of the College of Ruling Princes of the Imperial Diet. Nearly all the bishops of the Holy Roman Empire outside the Habsburg lands were prince-bishops. Prince-elector: The prince-electors or electoral princes of the Holy Roman Empire (German: sing. Kurfürst, pl. Kurfürsten) were the members of the electoral college of the Holy Roman Empire, having the function of electing the Holy Roman Emperors. the size of territory and population of the various polities whenever these are available. The following excerpt from François Velde's Unequal and Morganatic Marriages in German Law provides an excellent overview on what an Estate (or State) of the Empire is. For his purpose, the author deals only with the hereditary territorial rulers but it should be remembered that the Estates also included a substantial number of non-hereditary territorial rulers such as the ecclesiastical states (prince-bishoprics and imperial abbeys) and free imperial cities. The special status of these families manifested itself in the constitution of the Empire as it evolved in the 16th c. To the status of territorial ruler corresponded a seat and vote in one of the colleges of the Reichstag, the Imperial Diet. In the late 16th c., the multiplication of votes due to territorial fragmentation led to reforms. After the Diet held at Augsburg in 1582, the list of votes remained fixed, notwithstanding further territorial divisions. Furthermore, the right to vote became attached to a land, rather than to a person or family (of course, land was inheritable within families). A member of the Diet with seat and vote (individual or shared) was called a Reichsstand, or state of the Empire. At some point (Abt 1911, 103 n2 cites various possible dates, from the turn of the 16th c. to 1653 to the 18th c.), the definition of Hochadel became congruent with being a Reichsstand (adjective: reichsständisch). The reason is that the Emperor, as "fons nobilitatium," had the power to create new princes, counts and barons of the Empire, a power which he began to use more frequently. The existing princes, counts and barons were obviously loathe to see the value of their title diminished. The members of the Diet complained and, after 1582, it became the rule that such new princes and counts would not of right have a seat at the Diet. Furthermore, in 1653 the Electoral Capitulation included strict rules on the process by which the Emperor could create new states of the Empire. In particular, any new member had to possess an immediate territory of sufficient size, and had to be accepted by his peers (princes or counts). Only the first two groups were part of the Hochadel. Those in the third group were titular counts and princes but in no way accepted as part of the Hochadel. In principle, the possession of a territory was a pre-condition for admission in the Diet. However, in the second half of the 18th century a number of counts sat on the counts' benches without any such territory. They were called "personalists" because they had been admitted on a personal basis (ad personam), and some jurists did not consider them to be part of the upper nobility (e.g., Pütter 1795, 143). Possession of a large immediate territory was a condition for entry, but not a condition for remaining in the Diet. It happened that territories became subjected to another state of the Empire, thus losing immediate status; yet the owner remained in the Diet. Consequently, whereas, in the 16th century, it was fairly easy to say who was in the upper nobility and who wasn't, it had become more difficult by the turn of the 19th century. a seat and vote at the Imperial Diet (Reichsstandschaft). The three were "usually" related, in that the sovereign of a territory was a state of the Empire, and a state of the Empire usually had sovereignty over an immediate territory; but there were exceptions both ways. Various authors emphasized one or a combination of these elements. Thus, Runde (1791) required all three; Pütter emphasized sovereignty; Gönner and Leist emphasized seat and vote at the Diet. Among 19th century authors, the main division was between those who required all three criteria, and those who considered Reichsstandschaft to be the sole criterion (Hohler, Klüber, Zoepf, Rehm). Using the second, slightly broader concept, at the end of the 18th century the high nobility consisted of those families which had seat and vote at the Imperial Diet, with title of either prince or count (the last baronial family died out in 1775), numbering about 25 princely (fürstliche) and 80 comital (gräfliche) families. The following lists are going to be included into the table above. ^ Gagliardo, G., Reich and Nation, The Holy Roman Empire as Idea and Reality, 1763–1806, Indiana University Press, 1980, p. 4-5. ^ François Velde: Unequal and Morganatic Marriages in German Law. 2004–2007. Retrieved 2012 October 09. ^ Gönner, Nikolaus Thaddäus. Teutsches Staatsrecht. Landshut : Krüll, 1804. §74. ^ Leist, Justus Christoph. Lehrbuch des Teutschen Staatsrechts. Göttingen : Schneider, 1803. §32. The Arenberg Archives and Cultural Centre. "The Dukes of Arenberg". . Retrieved June 26, 2006. Austrian Federal Ministry for Education, Science and Culture. "aeiou: The Annotable, Elektronic, Interactive, Osterreich (Austria), Universal Information System". . Retrieved June 23, 2006. "Austrian and German Mediatized Houses, 1871–1919". . Retrieved July 4, 2006. "Braunschweig – Brunswick. A history". . Retrieved July 6, 2006. Cahoon, Benjamin M. (2000–2006). "Europe Index" in WorldStatesmen.org. . June 26, 2006. Dotor, Santiago (2004). "Historical Flags (Schleswig-Holstein, Germany)" in FOTW: Flags of the World Web Site. . Retrieved July 3, 2006. "Freiburg's History for Pedestrians" (2006). . Retrieved June 26, 2006. Graz, Thomas. "Thomas's Glassware Tour to Central Europe: Old Glasses from Old Europe" in German History Ring. . Retrieved June 20, 2006. Hilkens, Bob (2000). "States and Regents of the World: An Alphabetical Listing of States and Territories and their Regents in the 19th and 20th Centuries". [https://www.webcitation.org/5kmp0GkYu?url=http://www.geocities.com/CapitolHill/Rotunda/2209/index.html. Retrieved June 27, 2006. "History of the House of Sayn". . Retrieved July 13, 2006. Kane, Ed (2000). "Castle Directory: Alphabetical Listing of German Castles and Fortifications". . Retrieved July 28, 2006. The History Files: Kingdoms of Europe. Retrieved July 9, 2006 (Updated February 25, 2007). "Lippe(-Detmold): Chronology of Lippe" in Genealogy.net. . Retrieved June 25, 2006. Martinsson, Örjan. "Historical Atlas: Europe". . Retrieved July 14, 2006. "Medieval German Counties". . Retrieved July 9, 2006. "Milestones in Pomeranian History, with particular attention to Lauenburg and Buetow". . Retrieved June 26, 2006. Pantel, Mike (2000). "The History of Baden-Wurttemberg". . Retrieved June 25, 2006. Principality of Liechtenstein. "Liechtenstein at a Glance: History". . Retrieved June 25, 2006. Reitwiesner, William Addams (1998). "One of the major questions about the Mediatized Houses is the word 'Mediatized'. What does it mean?". . Retrieved July 1, 2006. Rozn, Val (1999–2003). "The German Reigning Houses: Titles, territories, regnal chronologies". . Retrieved June 9, 2006. Rozn, Val (2002). "The Imperial Nobility and the Constitution of the Holy Roman Empire". . Retrieved July 16, 2006. Sainty, Guy Stair. "European Royal Houses". . Retrieved June 23, 2006. Sainty, Guy Stair. "The Knights of Saint John in Germany". . Retrieved July 1, 2006. "Schaumburg-Lippe" in Genealogy.net. . Retrieved June 25, 2006. "Sovereigns in Germany". . Retrieved June 22, 2006. Voss, Hans Peter. "History of Schleswig Holstein". . Retrieved July 3, 2006. Bursik, Heinrich (1998). "Die Herrschaft Hohenberg und die Markgrafschaft Burgau". . For Google-translated English version . Retrieved July 9, 2006. "Das Fürstenhaus Bentheim-Tecklenburg". . For Google-translated English version, see . Retrieved July 11, 2006. Höckmann, Thomas (2006). "Territorial arrangement of North Rhine-Westphalia 1789". (Translation from the original in German through Google Search). [permanent dead link]. (Excellent articles and links about the States of the Holy Roman Empire). Retrieved June 26, 2006. "Mittelalterliche Genealogie im Deutschen Reich bis zum Ende der Staufer". . Retrieved June 23, 2006. Ortwein, Friedrich J. "Die Herren zu Rappoltstein" (The Lords of Rappoltstein)". [permanent dead link]. (For English translation: ). Retrieved June 25, 2006. "Die Reichsstände". . Retrieved July 8, 2006. Wember, Heinz. "Die Genealogie (Genealogy) von Montfort: Bludenz, Bregenz, Feldkirch, Heiligenberg, Herrenberg, Langenargen, Pfullendorf, Rheinegg, Rothenfels, Sargans, Tettnang, Tosters, Tübingen, Vaduz, Wasserburg, Werdenberg, Zollern". . Retrieved June 23, 2006. Höckmann, Thomas (2006). "Historical maps – Germany at the end of the 18th century". . Retrieved June 26, 2006. This page was last edited on 15 February 2019, at 04:49 (UTC).